While the basic elements of active learning classrooms are well known, no one-size-fits-all template exists. Here's how to achieve the custom fit your school needs. Like a jazz dance performance, active learning combines doing, movement and impromptu variety in a way that gets students and faculty up and out of their usual positions in the classroom. The room and its technology trappings become the stage and props for encouraging the unexpected to unfold. The goal of active learning is to create a space that can become the catalyst for change, noted Lennie Scott-Webber, director of education environments for Steelcase and former head of the Department of Interior Design & Fashion at Radford University (VA). "When you open the door to a space, does it give you permission to act differently other than to be behaviorally conditioned to 'sit and git' or 'stand and deliver'? If the space doesn't give permission to change, then it's too easy to revert back to what we know." Designing and outfitting a classroom for active learning doesn't have to be particularly complicated or excessively pricey. Still, the process you follow should be a unique choreography suited specifically to your campus's needs. CT asked experts from institutions across the country to share their top tips, tricks and pitfalls. 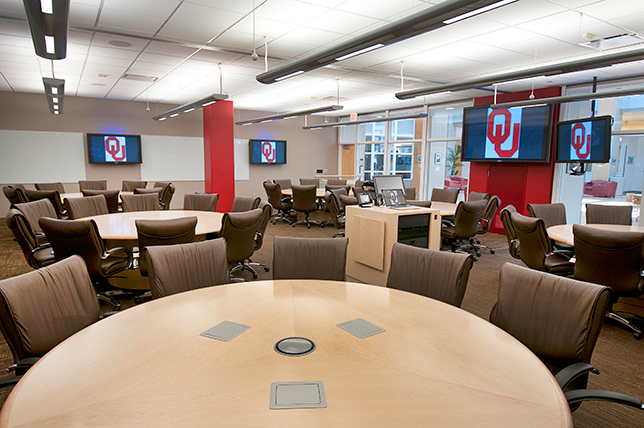 The University of Oklahoma's first active learning space was "no holds barred, very high budget, very 'bells and whistley,' very executive-looking," said Chris Kobza, OU's manager of IT learning spaces. But that kind of budget is out of the reach of the average college or department, so for subsequent spaces, Kobza and Director of Strategic Initiatives Erin Wolfe changed their design approach "a little bit to make it more economical." As Kobza explained, "You can do nice tables that don't move; you can do flexible tables that do. You can do really high-end technology or maybe you just want some nice whiteboards and [basic] technology. We have spaces that are very flexible and mobile and almost scattered in a way. Then we've got other spaces that are just structured looking and still high tech and flexible, but not in a way that you're going to see 60 kids with papers and laptops and bags and skateboards thrown all over the place." Kobza and Wolfe tailored the design for each room based on the specific requirements of the people "who owned the spaces" and the faculty who use them. (See "4 Questions to Guide Classroom Design" below.) "What ultimately came out of that was a cohort of spaces that are all different in some ways," said Kobza, but "deep down they're all really similar." Not including physical renovation of the spaces, budgets for furniture and technology run from $40,000 or $50,000 on the low end to nearly 10 times that on the high end. "Really," said Kobza, "the high dollar stuff comes down to really specific technical requirements or a space that you want to showcase — something you want to use to attract students or faculty or show to donors or something like that. It's not going to have as big an impact on the actual learning experience." The process starts when they sit down with the person or people who want to redo a room to find out what they envision — is it maximum technology or maximum flexibility? "It's a real casual conversation but you can learn enough about what their expectations for the space are, what the expectations for their faculty are, what they hope the students get out of the space," said Kobza. Next, they ask what the focus is — teamwork, digital content work or something else. Then they ask how flexible the room should be. Do the room sponsors want movable everything (including technology), or do they want movable furniture and basic technology options? Finally, and only at the end of the discussion, they ask the money question: What's the budget? Even though that's what people typically open the conversation with, budget isn't as important as people make it out to be, Kobza and Wolfe noted. "You're going to have spaces that look different and might operate a little bit differently, but they really do 90 percent of the same stuff, and they accomplish the exact same mission," said Kobza. A shift in curriculum to a team-based active learning approach at Bryant University (RI) cried out for a new kind of classroom, so the institution set up the Ideation Lab, a 24- to 32-student space where every surface is writable, the furniture is modular and, as Robert Shea, associate vice president for teaching and learning, noted, "it's a great place to teach." Usage is in "excess of 90 percent." 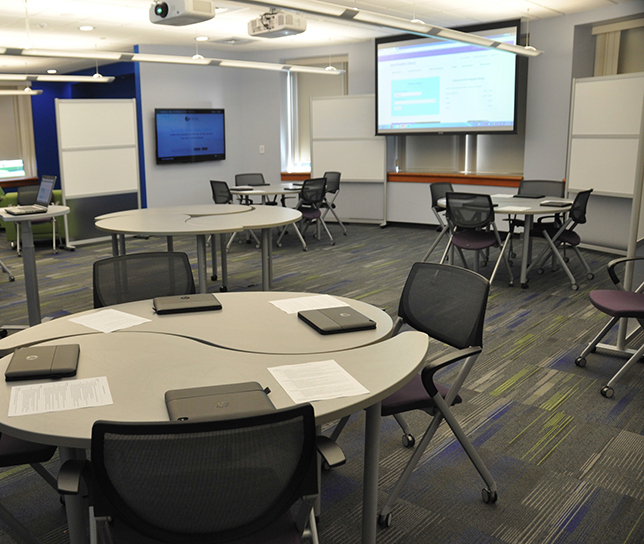 For its second active learning space, instigated when the university received the donation of a new telepresence system, the decision was made to turn around a room where nobody wanted to go. Bello 102, a classroom with a legacy teleconferencing system housed in the library, "had big hulking cables in there and when you were in the back of the room, you could barely see the screen. There was no permanent whiteboard space; you had to wheel one in," Shea recalled. It was the "lowest utilized classroom space on campus." In fact, he added, if adjunct faculty weren't scheduled in there, usage "probably would have been zero." One advantage: Not much had to be done with the wiring, Shea pointed out — just buying new furniture, doing technology for the wireless projector and installing the telepresence system. Now he takes formal proposals from faculty on how they might use Bello 102. "I'm in the process of reviewing them now and trying to get as many folks into that space as I can," he said. More recently, a group of faculty came together and asked for a third active learning space — this time in the main academic building. As Shea recounted, technology wasn't even on the wish list. "If it just gives us the ability to have students working in teams, it would be great practice for us," the faculty told him. Shea and his team have identified the space where the classroom could be implemented, and facilities has been brought in to identify surplus furniture that might work. Shea has pared down the list of must-haves for active learning to just a few elements: first, furniture that can be moved around and the space to do it in; and second, the ability for students to capture the work they're doing together — "whether low tech or high tech." 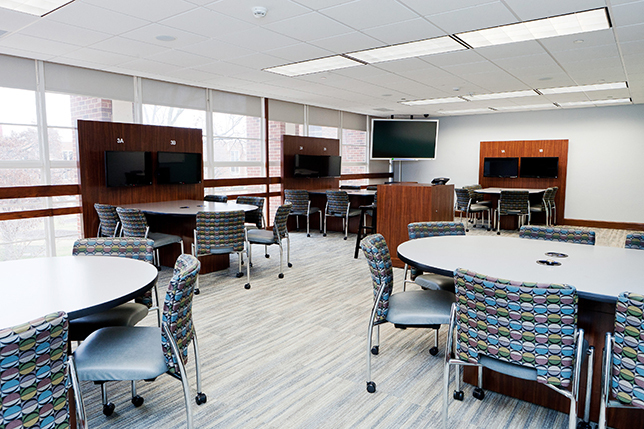 Stonehill College's (MA) first active learning space was inspired in 2012 when a faculty learning spaces committee began a reading group to discuss the topic. 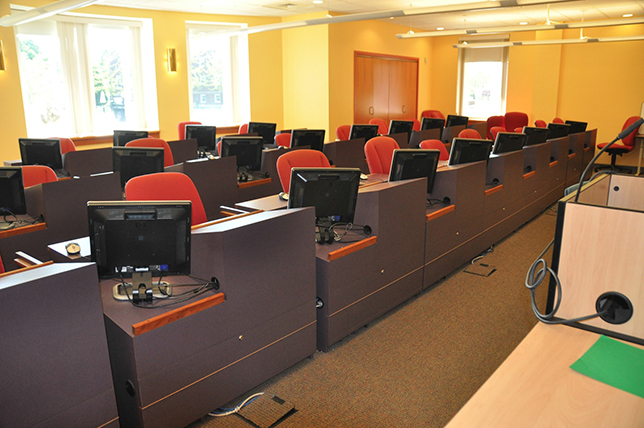 That group pinpointed "room 116" in the library as a target site for a classroom revamp: a long space filled with student computers sitting on forbidding platforms in three rows. The idea was to view the middle part of the room as the primary "teaching corridor," leaving the wings as study areas for students that could be walled off with movable screens. With no funding for the renovation, Stonehill pursued grant money. The George I. Alden Trust, which supports "smaller institutions," supplied 90 percent of the funding, which was estimated to be about $200,000. The remainder came from the college's IT department, which tapped funds budgeted to update the computers in that room. With funding in place, demolition started in May 2014; the Brian J. Flynn Discovery and Collaboration Space, dubbed the DisCo, opened for business last August. Choosing the library turned out to be a savvy move for Stonehill, said Liz Chase, head of collections, assessment and user engagement at MacPháidín Library. "We see a broad crosscut of classes from across campus. I think that gives us the unique perspective." Because the library sees what every academic program is doing, it has the ability to "think about a space that can be used by all of those departments." As Chase noted, "No one department owns our space and everyone has equal access to it." Just as faculty need time to understand how to orient themselves in an active learning classroom, so do the students. "They don't know to how to act either," pointed out Steelcase's Scott-Webber. You'll get better results if you help students understand the process and how the class will work. 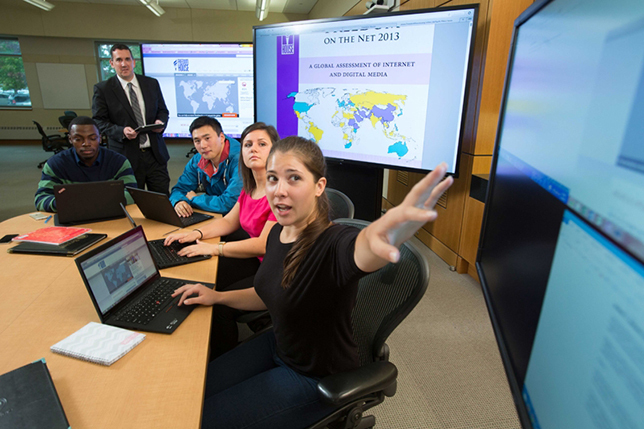 When Stonehill opened its new active learning classroom, there was an underlying sense that it would "immediately transform everything that happens in that space," recalled Chase. The reality is that while it "transformed a good deal of what we're doing, there are still some classes where we're doing a little bit more of a traditional instructional session." For a while that tepid outcome disappointed the librarians. But eventually they realized that the larger picture showed something else: "Yes, we might have one or two or three sessions that are a little more traditional, but we also have all of these other uses of the space that are happening now and that we've enabled by doing this renovation." 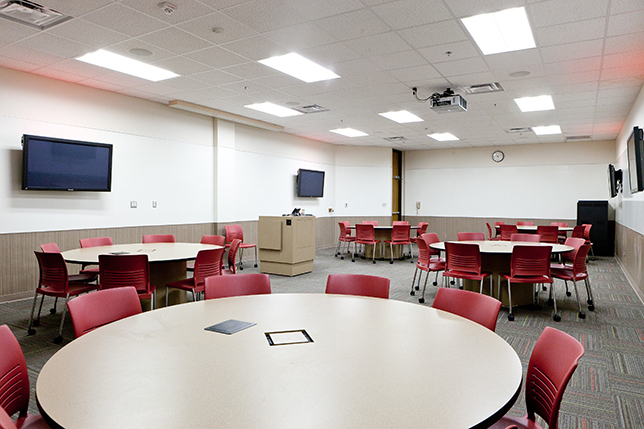 Selecting a space to transform into an active learning classroom can be rife with politics. Not only does it suggest favoritism — particularly when it's being funded by the provost rather than a given department or program — but it can also entail a battle with the registrar's office, because that room is being removed from the inventory of available classrooms, which makes course scheduling that much more difficult. Derrell Jackson, Herman Miller's director of education, advised rounding up your advocates at the front end and planning to collect data at the back end. "If you get a body of people behind you, you can go to leadership and say, 'We want to do these things. We believe this space can help us.'" Once the space is granted, it's time to do some pre- and post-occupancy surveys. The goal, explained Jackson, is to get impressions of students and faculty about the traditional classroom before its transformation, and again after they've been in the space for a semester. The data you collect will serve two purposes. 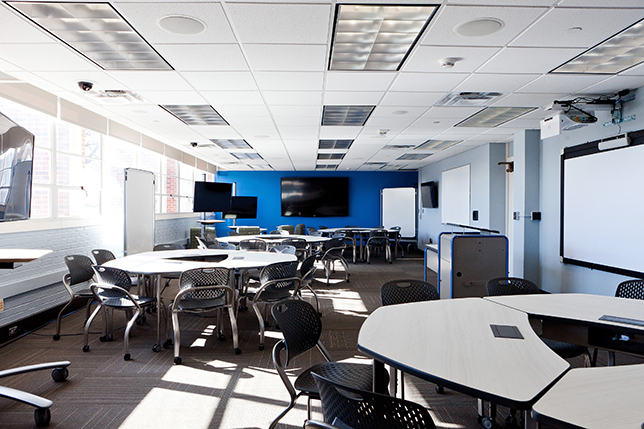 First, if the newly redesigned classroom worked, that data can help you build the case for expanding to other spaces on campus. Second, the data will give you insights about what didn't work. As an example, Jackson cited one school that leveraged soft seating in the new environment. The data confirmed that "students loved it in the beginning." However, by the end, "they were clamoring for more work surface. So we learned that you have to have a balance between the comfort seating and standard student tables to really accommodate great learning in a space." One major challenge that OU has faced in its expansion of active learning classrooms is the tight turnaround most project sponsors expect. "A lot of times people come to us and they want these very quickly, because maybe they have funds running out at the end of the fiscal year or they want [the spaces] online by the next academic year," said Wolfe. When there's only a few months to produce the new space, racing through the process of what the room should become, choosing "furniture, finishes and technology" and then getting it "installed and up and running" and training faculty, that "really creates some difficulties," she added. Her wish is to get a year for the makeover. "If we could have that, it would make our lives a lot easier." The demand for the spaces "has been constant," said Kobza. "But if it was up to me and a lot of other people, we would have 60 of these things on campus. We really want to see this occupy a much larger percentage of our campus learning spaces. We've still got a long way to go before we get there." Ask yourself, "Are classrooms on the college tour?" advised Lennie Scott-Webber, director of education environments for Steelcase. If the answer is no, your campus may be ready for a classroom reboot. "The classroom is not only where the students will be for however long their career path portion takes, but that's where the faculty go to work every day in their educational arena. If it is not on the tour, then you have to ask yourself, what are you ashamed of?" Look for examples of active learning on campus. Check out your design studio courses, suggested Scott-Webber. "You usually have a four- to six-hour block," she noted. And in that situation, "Boy, you've got to learn how to manage active learning awfully quickly. It's all problem-based or project-based learning. You present the same problem to 24 students, and they're all going to have the right answer — it's just not the same right answer. Lower the bar to entry. While some schools make a practice of putting faculty through extensive sessions of training before they gain access to the rooms, the University of Oklahoma went the other way — and sped up adoption. "We wanted professors who were already doing this well [to have a] place to do it," explained Chris Kobza, manager of IT learning spaces. "But additionally we wanted to give professors who were thinking they might want to start incorporating this sort of learning into their courses a place to try it out. We didn't want to create a high bar of entry to this." To sustain their efforts, the university provides support, training and learning communities. Ignore the naysayers. When seeking people to use new active learning classrooms, start with the most interested faculty, recommended Robert Shea, associate vice president for teaching and learning at Bryant University (RI). Then pursue the curious bystanders, who — with a little "incentivizing" — will move forward. But don't seek 100 percent success, he advised: "You can waste an awful lot of time and resources trying to move the most recalcitrant faculty." Provide just-in-time tech. For the first week a faculty member is new to the classroom, suggested Derrell Jackson, director of education at Herman Miller, have the IT specialist hover in the area, so he or she can pop in and say, "Okay, here's how you use this iPad to connect wirelessly with this technology" or "Here's how you use the interactive whiteboard." Do "purposeful marketing." Stonehill College (MA) makes a point of taking photographs and capturing quotes from faculty as they cycle classes through the institution's library-based active learning space. Then those pieces are turned into stories for the library's biweekly newsletter. According to Liz Chase, head of collections, assessment and user engagement at MacPháidín Library, that kind of marketing helps woo instructors who now will realize they can't simply do "the same thing" or who don't know that you've built the new space in the first place. Get stakeholder feedback. Stonehill posted architectural renderings in public spots and, over the course of a couple of weeks, invited stakeholders — faculty members, students and library staff — to write feedback on sticky notes. People became "very specific," said Chase. For example, images of different kinds of seating included a picture of an ottoman with five little chairs that "looked like a flower." One observer wrote, "This looks great but doesn't look comfortable for studying long-term." The college went with other seating choices. Encourage students to voice their support. Bryant U's Shea asked students to create videos that he could share with the anonymous donor who supported the reboot of Bello 102. As one student from last year's class responded, "Thank you for making this space available. It's added so much to my educational experience. I'm confident that students at other campuses are not having this level of technology made available to them." Concluded Shea, "I think that's representative of what a lot of students feel about the room."